How to give Web Options for KNRUHS PG Medical Admissions. How to Exercise Web Options for KNRUHS PG Medical Admissions. 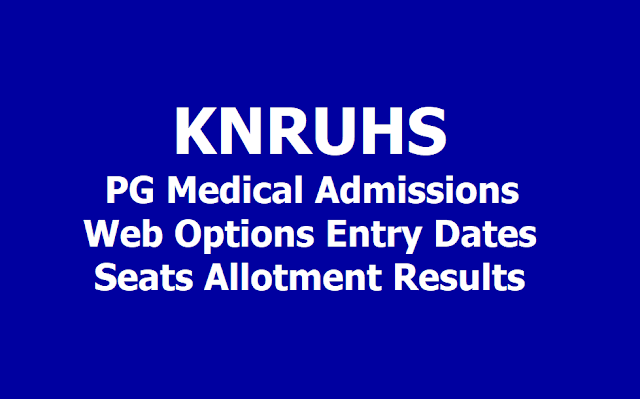 KNRUHS PG Medical Admissions Web Options Entry Dates 2019, KNRUHS PG Medical Admissions Seats Allotment Results 2019. KNRUHS PG Medical Admissions Seat Allotment letter download and more details here. 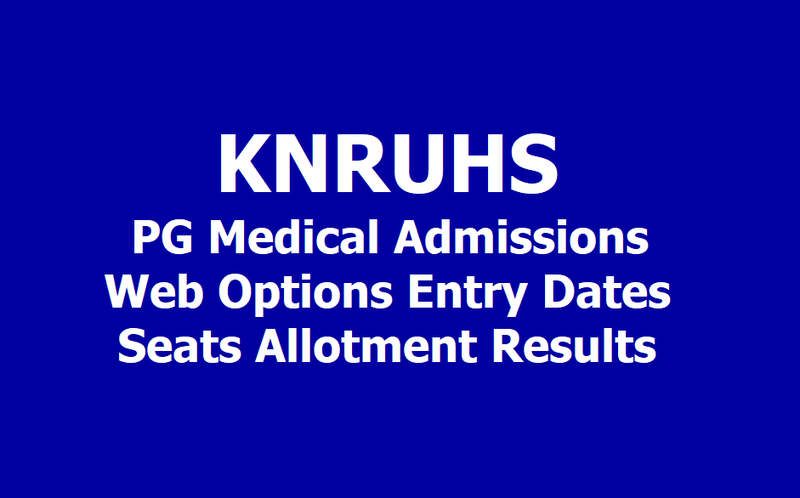 KNRUHS PG Medical Admissions Web Options Entry Dates 2019, Seats Allotment Results: Kaloji Narayana Rao University of Health Sciences, Telangana:: Warangal has issued the notification for Exercising Web options for First Phase Counselling of PG Medical Degree / Diploma Admissions Under Competent Authority Quota Into Medical Colleges Affiliated to KNRUHS & NIMS for Post Graduate Medical Admissions Under Competent Authority Quota 2019-20. In continuation of earlier notification dated 22-03-2019 and 28-03-2019 KNR University of Health Sciences hereby notifies the conduct of 1st phase of web based counseling for allotment of the Post Graduate Medical seats under Competent Authority Quota for admission into PG Medical Degree / Diploma courses for 2019-2020 in Medical colleges of Telangana State affiliated to KNRUHS, Warangal , Nizams Institute of Medical Sciences, Hyderabad and also for Competent Authority Quota seats in Minority Medical Colleges. The candidates who had their original certificates verified in the first and final phase of verification of Original Certificates and whose names are notified in the final merit list of PG Medical Admissions on the website of KNR UHS Warangal only are eligible to exercise web- options online from Home or any Internet facility center with Internet Explorer 11 version. All the eligible candidates whose names are displayed in the Final Merit list on KNR UHS website can exercise web options for admission into PG Medical Degree / Diploma seats in the Medical Colleges affiliated to KNRUHS and NIMS, Hyderabad from 8.00 A.M. on 05-04-2019 to 5.00 P.M. on 07-04-2019 . For eligibility criteria and regulations refer to notifications dated: 22-03-2019 and 28-03-2019. Allotted Candidates have to pay University fee of Rs.20,600/- by way of payment gate-way on-line and down-load the allotment letter. Tuition fee is to be paid at respective Medical colleges. The tuition fee payable as per Government of Telangana orders vide G.O.Ms.No. 41 HM&FW (C1) Department Dt: 09-05-2017 for Non-Minority Medical Colleges and G.O.Ms.No. 43 HM&FW (C1) Department Dt: 09-05-2017 for Minority Medical Colleges and as per Hon'ble High Court orders. Competent Authority Quota seats in Minority Medical Colleges will be allotted to Muslim Minority Candidates only. Muslim Minority Candidates are also eligible for Competent Authority Quota seats in other Medical Colleges. Persons With Disabilities (PWD) whose names are displayed in the eligible candidates list can exercise web options for seats reserved under PH category. The allotment of seats will be made in accordance with the existing Government orders and relevant Hon'ble Supreme Court and Hon'ble High Court orders. 1) Eligible PG Medical Candidates as per final merit list can give web options for Post Graduate seats in all Medical colleges and NIMS, Hyderabad as per their interest and priority. 2) Eligible Service Candidates whose names are displayed in the final merit list of PG Medical Admissions on KNURHS web-site after addition of weightage of marks can exercise web options for PG Degree seats for Medical Colleges affiliated to KNRUHS & NIMS. 3) Eligible Service Candidates whose names are displayed in the final merit list for PG Medical Admissions on KNRUHS web-site can exercise web options for PG Diploma seats reserved in Medical Colleges affiliated to KNRUHS, as there is 50% reservation of seats in Diploma Courses only to Eligible in-service Candidates serving in remote and difficult areas. 4) Candidates are advised to go through the prospectus of KNRUHS and NIMS available on website before exercising web options for the regulations. 5) Candidates opting for PG Medical Degree / Diploma courses are informed that, there is no limit of choices (number )for exercising web-options, candidates can give options for any number of subjects and colleges the candidate is interested to join as per eligibility. 6) Candidates are advised to exercise options for seats in courses and colleges in which they are interested to join. If they are not interested to join in any subject or college, they should not exercise options for the same. 7) Important note : candidates are informed that if they exercise web- options for a seat and allotted a seat as per their choice in the web- counseling and if they do not join the course at the allotted college they will not be eligible for exercising weboptions for next rounds of counseling to prevent seat blocking. 8) Candidates can exercise options on the web either from helpline centre / home / any other place having internet explorer 11 facility. Candidates can also exercise web options from helpline centres at JNTU Kukatpally and PGRRCDE OU Campus, Hyderabad on the days notified for exercising web-options from 9.00 A.M. to 5.00 P.M.
9) One Time Password will be sent to the registered mobile at the time of saving web options. The password consists of SIX letter code with English capitals A to Z (for details read instructions to the candidates before giving options. 10 ) The selected candidates shall download the allotment letter from website after payment of the University fee by gateway method by using Online payment method. (Debit Card/Credit Card/Internet Banking), check their allotment and report to the Principal of respective college before the date specified on the allotment letter. 11) Selected candidates have to report at the respective colleges before the last date for joining as specified on the allotment letter with all original certificates, submit the relevant bonds and pay the tuition fee / college fee to complete the process of admission. If the candidate does not fulfill the above criteria to complete the admission process within the specified date the admission will be cancelled automatically. 12) Original certificates will not be returned to the candidate, unless the candidate discontinues the course or slides to other college in All India Counseling. If the candidate slides to other college during subsequent phase of counseling, the original certificates will be sent to the college concerned after the closure of admissions. 13) Candidates will have to pay discontinuation amount, if they discontinue the course after the notification is issued for final round of ( Mop-Up) exercising web options for counseling or later to get their original certificates back as per Government regulations. 14) The University fee and other fees once paid shall not be refunded under any circumstances. Candidates can call helpline centers on 9502001583 & 8466924522 for any assistance.